If you haven’t watched “Inside Claridges”, the BBC Documentary that goes behind the scenes at one of London’s most luxurious hotels, I can’t recommend it too highly as a masterclass in delivering excellence. 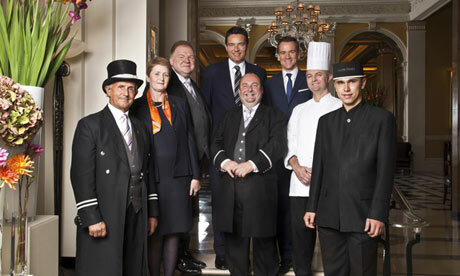 You can download it at BBC iPlayer and I would particularly commend episode three: filmed in the run-up to and during London 2012, the programme shows how the Claridges Team goes above and beyond its “standard” offering, honed over its 200-year history, in order to put on a show worthy of the extravaganza that was London in Olympics mode. As General Manager Thomas Kochs explains, the management Team wanted to do something extra special – so they persuaded René Redzepi, the co-owner and Executive Chef of Noma, the world’s best restaurant, to bring Noma’s unique and terrifyingly exacting, culinary experience to Claridges for ten days. This involved such Herculean efforts as arranging for a Norwegian ant-forager to hand-gather 16,000 ants in two days and deliver them personally to the Claridges kitchen. Serving 170 covers daily (compared to Noma’s usual 45 covers), in a style of cooking and presentation that were dramatically different to the hotel’s normal product, Claridges’ deputy HR director was despatched to Norway halfway through the event in order to collect and deliver a further 10,000 ants. Kochs described the period as being akin to running three businesses simultaneously: the logistical challenge of hosting hordes of international dignitaries and delegations for the Olympics; business as usual for the “normal guests”; and the Noma experience. The seamless way this was achieved exemplified what I believe is the fundamental Success Formula for any service business: (SE (Service Excellence) + CE (Communication Excellence) + LE (Leadership Excellence)). Claridges’ core offering encapsulates not just a stunning Setting, a Team trained to deliver anything that is asked of it – all driven by the Customer – but also Systems that can be applied to any situation, enabling the Service to flex whilst maintaining excellence throughout. It was quite clear that the standard of Communication at the hotel is exemplary too. Every member of the Team, at every level, knows their role, understands what they must do to deliver what is needed, and above all, is driven and motivated by a focus on Claridges’ Purpose, i.e. Why it exists and why its customers love it so much. Thirdly, Thomas Kochs’ attention to detail, his personable demeanour and steely determination model great Leadership. I can’t wait to hear more of his personal and professional philosophy when he is in discussion with interior designer Guy Oliver at the V&A next month. Kochs’ summing up of the hotel and why it remains so successful – “I think people are now curating their lives, in a series of unique experiences, and we provide that” – shows how a 200-year old, outwardly deeply conservative institution, completely understands today’s consumer. Through its world-class commitment to all the elements of the Success Formula, Claridges has the built-in capability to go from strength to strength.